Amyotrophic lateral sclerosis (ALS) is a neurodegenerative disease mainly affecting upper and lower motor neurons in the brain and spinal cord. Pathogenesis of ALS is still unclear, and a multifactorial etiology is presumed. The remarkable clinical heterogeneity between different phenotypes of ALS patients suggests that environmental and lifestyle factors could play a role in onset and progression of ALS. We analyzed a cohort of 117 ALS patients and 93 controls. ALS patients and controls were compared regarding physical activity, dietary habits, smoking, residential environment, potentially toxic environmental factors and profession before symptom onset and throughout the disease course. Data were collected by a personal interview. For statistical analysis descriptive statistics, statistical tests and analysis of variance were used. ALS patients and controls did not differ regarding smoking, diet and extent of physical training. No higher frequency of toxic influences could be detected in the ALS group. ALS patients lived in rural environment considerably more often than the control persons, but this was not associated with a higher percentage of occupation in agriculture. There was also a higher percentage of university graduates in the ALS group. Patients with bulbar onset were considerably more often born in an urban environment as compared to spinal onset. Apart from education and environment, ALS phenotypes did not differ in any investigated environmental or life-style factor. The rate of disease progression was not influenced by any of the investigated environmental and life-style factors. The present study could not identify any dietary habit, smoking, physical activity, occupational factor as well as toxic influences as risk factor or protective factor for onset or progression of ALS. Living in rural environment and higher education might be associated with higher incidence of ALS. Aging is characterized by a progressive loss of skeletal muscle mass and function (sarcopenia). Obesity exacerbates age-related decline and lead to frailty. Skeletal muscle fat infiltration increases with aging and seems to be crucial for the progression of sarcopenia. Additionally, skeletal muscle plasticity modulates metabolic adaptation to different pathophysiological situations. Thus, cellular bioenergetics and mitochondrial profile were studied in the skeletal muscle of overweight aged people without reaching obesity to prevent this extreme situation. Overweight aged muscle lacked ATP production, as indicated by defects in the phosphagen system, glycolysis and especially mostly by oxidative phosphorylation metabolic pathway. Overweight subjects exhibited an inhibition of mitophagy that was linked to an increase in mitochondrial biogenesis that underlies the accumulation of dysfunctional mitochondria and encourages the onset of sarcopenia. As a strategy to maintain cellular homeostasis, overweight subjects experienced a metabolic switch from oxidative to lactic acid fermentation metabolism, which allows continued ATP production under mitochondrial dysfunction, but without reaching physiological aged basal levels. This ATP depletion induced early signs of impaired contractile function and a decline in skeletal muscle structural integrity, evidenced by lower levels of filamin C. Our findings reveal the main effector pathways at an early stage of obesity and highlight the importance of mitochondrial metabolism in overweight and obese individuals. Exploiting mitochondrial profiles for therapeutic purposes in humans is an ambitious strategy for treating muscle impairment diseases. Phenotypic transformation of vascular smooth muscle cells (VSMCs) contributes to vascular remodeling in hypertension. High mobility group box-1 (HMGB1) has been reported to be involved in several pathogenic processes including VSMC proliferation and migration. The present study was designed to determine the role of HMGB1 in VSMC phenotypic transformation in hypertension. First, we demonstrated that HMGB1 was elevated in a model of Ang II-induced VSMC phenotypic transformation, which showed down-regulation of contractile proteins and up-regulation of synthetic proteins. Knockdown of HMGB1 and losartan could block the phenotypic transformation. Next, we identified three potential miRNAs for upstream regulation of HMGB1 by bioinformatic analysis; only miR-181b-5p was significantly down-regulated in Ang II-treated cells. Co-treating the cells with miR-181b-5p mimics suppressed HMGB1 expression as well as the phenotypic transformation, migration, and proliferation. Furthermore, the luciferase reporter gene assay confirmed the direct interaction between miR-181b-5p and HMGB1. Finally, to extend these cell-based studies to clinical patients, we demonstrated that plasma miR-181b-5p levels were decreased, while Ang II and HMGB1 levels, as well as the intima-media thickness (IMT) were increased in hypertensive patients; these effects were reversed following the administration of angiotensin receptor blockers. Based on these observations, we conclude that the down-regulation of miR-181b-5p leads to the elevation of HMGB1 levels in hypertensive patients, which accounts, at least partially, for VSMCs phenotypic transformation and vascular remodeling. Our findings also highlight that the plasma levels of miR-181b-5p and HMGB1 may serve as novel biomarkers for vascular remodeling in the hypertensive patients. The longitudinal association between glycated hemoglobin (HbA1c) and different courses of depressive symptoms is understudied. This study aimed to identify different trajectories of depressive symptoms and investigate the relation of HbA1c with the risk of increasing and high-stable depressive symptoms. In the China Health and Retirement Longitudinal Study, depressive symptoms were measured using the 10-item Center for Epidemiological Studies-Depression scale in three visits (years: 2011, 2013 and 2015) among 9804 participants (mean age 60.0 ± 9.0 years). Group-based trajectory modeling was used to identify trajectories of depressive symptoms. HbA1c was measured at baseline and categorized five groups according to the respective quintile. Multinomial logistic regression was fitted to examine this relationship. Four distinct trajectories of depressive symptoms were identified: low symptoms (n=6401, 65.29%); decreasing symptoms (n=1362, 13.89%); increasing symptoms (n=1452, 14.81%); and high symptoms (n=1452, 14.81%). Adjusting for demographic, health-related, and cognitive factors, the risk ratio (95% confidence interval) pertaining to the highest HbA1c (Quintile 5) for decreasing, increasing, and high symptoms of depression versus low symptoms was 1.01 (0.82-1.25), 1.12 (0.92-1.36), and 1.39 (1.04-1.86) compared with the lowest HbA1c (Quintile 1), respectively. We observed a J-shaped relationship between HbA1c and high depressive symptoms, with the lowest risk at a HbA1c concentration of 5.0%. In summary, in this large population-based cohort, high levels of glycated hemoglobin concentrations were associated with a higher risk of increasing and high-stable symptoms of depression. Statins have proven to exert protective effects in patients with symptomatic intracranial atherosclerotic stenosis (SICAS). It is unclear whether intensive lipid-lowering therapy (ILLT) can ameliorate atherosclerosis in asymptomatic ICAS (AICAS). A single-center, prospective cohort study was performed in 71 AICAS patients with lipid-lowering therapy. Vascular stenoses were evaluated with transcranial color-coded sonography (TCCS) before and after statin treatment. With target therapeutic level of low-density lipoprotein cholesterol (LDL-C) ≤ 1.8 mmol/L or ≥ 50% reduction from baseline after the two years of follow-up, patients were divided into intensive statin treatment (IST) group and standard statin treatment (SST) group. A total of 104 stenotic intracranial arteries were detected in 51 patients belonging to the IST group and 47 arteries in 20 patients of the SST group. In the first year, LDL-C levels were significantly decreased in the IST compared with SST groups (1.48 ± 0.26 vs. 2.20 ± 0.58, P=0.000). However, the ratio of regressed ICAS in IST was not significantly higher than that in SST (26.3% vs. 5.9%, P=0.052). Forty-nine branches in 25 patients of the IST group and 16 branches in 7 patients of the SST group were followed up for two years. The LDL-C level was decreased in the IST compared with SST groups (1.55 ± 0.29 vs. 2.36 ± 0.77, P=0.048). The ratio of regressed ICAS in the IST group was significantly higher than that in SST group (34.7% vs. 6.3%, P=0.017). We concluded that the degree of stenosis in AICAS can be ameliorated with intensive lipid-lowering therapy within two years; target LDL-C level can be reached by moderate-intensity statin treatment for Chinese AICAS patients. Dietary proteins are sources of some amino acid precursors of two neurotransmitters relevant for biological rhythms, serotonin and melatonin, which are involved in sleep and alertness. Meat is the main source of proteins in many countries. Furthermore, meat consumption is of special interest because it provides high-quality protein as well as saturated and trans fatty acids. However, its effect on sleep patterns is unclear. Thereby, the aim was to examine the association of habitual meat consumption with changes in sleep duration and with sleep quality in older adults. We used data from 1,341 participants in the Seniors-ENRICA cohort aged ≥60 years, followed from 2012 through 2015. Habitual meat consumption was assessed at baseline with a validated diet history. Sleep duration and quality were ascertained both in 2012 and 2015. Analyses were performed with logistic regression and adjusted for socio-demographic variables, lifestyle, morbidity, sleep duration and poor sleep indicators at baseline. During follow-up, 9.0% of individuals increased and 7.9% decreased their sleep duration by ≥2 hours/night. Compared with individuals in the lowest tertile of meat consumption (<87 g/d), those in the highest tertile (≥128 g/d) showed increased incidence of a large decrease (≥2 h) in sleep duration (OR: 1.93; 95% CI:1.01-3.72; p-trend:0.04). Higher consumption of meat was also associated with incidence of snoring (OR:2.06; 95% CI:1.17-3.60; p-trend:0.01) and poor general sleep quality (OR:1.71; 95% CI:1.04-2.82; p-trend:0.03). Each 100 g/d increment in meat intake was associated with a 60% higher risk of both large sleep duration changes and poor sleep quality (OR:1.60; 95% CI:1.07-2.40). Results were in the same direction for red and processed meat and for white meat separately, and among individuals with physical impairment. Higher meat consumption (≥128 g/d) was associated with changes in sleep duration and with poor sleep in older adults. The identification of more reliable diagnostic or prognostic biomarkers in age-related neurodegenerative diseases, such as Amyotrophic Lateral Sclerosis (ALS), is urgently needed. The objective in this study was to identify more reliable prognostic biomarkers of ALS mirroring neurodegeneration that could be of help in clinical trials. A total of 268 participants from three cohorts were included in this study. The muscle and blood cohorts were analyzed in two cross-sectional studies, while the serial blood cohort was analyzed in a longitudinal study at 6-monthly intervals. Fifteen target genes and fourteen proteins involved in muscle physiology and differentiation, metabolic processes and neuromuscular junction dismantlement were studied in the three cohorts. In the muscle biopsy cohort, the risk for a higher mortality in an ALS patient that showed high Collagen type XIX, alpha 1 (COL19A1) protein levels and a fast progression of the disease was 70.5% (P < 0.05), while in the blood cohort, this risk was 20% (P < 0.01). In the serial blood cohort, the linear mixed model analysis showed a significant association between increasing COL19A1 gene levels along disease progression and a faster progression during the follow-up period of 24 months (P < 0.05). Additionally, higher COL19A1 levels and a faster progression increased 17.9% the mortality risk (P < 0.01). We provide new evidence that COL19A1 can be considered a prognostic biomarker that could help the selection of homogeneous groups of patients for upcoming clinical trial and may be pointed out as a promising therapeutic target in ALS. Cataract is a major cause of blindness worldwide, its complicated and unclear etiopathogenesis limit effective therapy. Here, we found that Yap, a downstream effector of the Hippo pathway, is specifically expressed in lens epithelial cells and Yap conditional knockout (cKO) in the lens leads to cataract. Histologically, Yap deficient lens show fewer epithelial cells, retention of nuclei and accumulation of morgagnian globules in the transitional zone and the posterior area. Mechanistically, GFAP-mediated Yap cKO leads to the reduced proliferation of epithelial cells, delayed fiber cell denucleation and increased cellular senescence in lens. Further RNA profiling analysis reveals Yap cKO results in a significant alteration in gene transcription that is involved in eye development, lens structure, inflammation, cellular proliferation and polarity. Collectively, our data reveal a novel function of Yap in the lens and links Yap deficiency with the development of cataract, making Yap a promising target for cataract therapy. Alzheimer’s disease (AD), which is the most major cause of dementia, is a progressive neurodegenerative disease that affects cognitive functions. Even though the prevalence of AD is continuously increasing, few drugs including cholinesterase inhibitors and N-methyl D-aspartate-receptor antagonists were approved to treat AD. Because the clinical trials of AD drugs with single targets, such as β-amyloid and tau, have failed, the development of multi-target drugs that ameliorate many of the symptoms of AD is needed. Thus, recent studies have investigated the effects and underlying mechanisms of herbal formulae consisting of various herb combinations used to treat AD. This review discusses the results of clinical and nonclinical studies of the therapeutic efficacy in AD and underlying mechanisms of the herbal formulae of traditional Oriental medicines and bioactive compounds of medicinal plants. Sarkar Saumyendra N., Russell Ashley E., Engler-Chiurazzi Elizabeth B., Porter Keyana N., Simpkins James W.
Aging is a complex and integrated gradual deterioration of cellular activities in specific organs of the body, which is associated with increased mortality. This deterioration is the primary risk factor for major human pathologies, including cancer, diabetes, cardiovascular disorders, neurovascular disorders, and neurodegenerative diseases. There are nine tentative hallmarks of aging. In addition, several of these hallmarks are increasingly being associated with acute brain injury conditions. In this review, we consider the genes and their functional pathways involved in brain aging as a means of developing new strategies for therapies targeted to the neuropathological processes themselves, but also as targets for many age-related brain diseases. A single microRNA (miR), which is a short, non-coding RNA species, has the potential for targeting many genes simultaneously and, like practically all other cellular processes, genes associated with many features of brain aging and injury are regulated by miRs. We highlight how certain miRs can mediate deregulation of genes involved in neuroinflammation, acute neuronal injury and chronic neurodegenerative diseases. Finally, we review the recent progress in the development of effective strategies to block specific miR functions and discuss future approaches with the prediction that anti-miR drugs may soon be used in the clinic. Coronary artery disease (CAD) is the result of atherosclerotic plaque development in the wall of the coronary arteries. The underlying mechanism involves atherosclerosis of the arteries of the heart which is a relatively complex process comprising several steps. In CAD, atherosclerosis induces functional and structural changes. The pathogenesis of CAD results from various changes in and interactions between multiple cell types in the artery walls; these changes mainly include endothelial cell (EC) dysfunction, vascular smooth muscle cell (SMC) alteration, lipid deposition and macrophage activation. Various blood markers associated with an increased risk for cardiovascular endpoints have been identified; however, few have yet been shown to have a diagnostic impact or important clinical implications that would affect patient management. Noncoding RNAs, especially microRNAs (miRNAs) and long noncoding RNAs (lncRNAs), can be stable in plasma and other body fluids and could therefore serve as biomarkers for some diseases. Many studies have shown that some miRNAs and lncRNAs play key roles in heart and vascular development and in cardiac pathophysiology. Thus, we summarize here the latest research progress, focusing on the molecular mechanism of miRNAs and lncRNAs in CAD, with the intent of seeking new targets for the treatment of heart disease. Age-associated chronic inflammation is characterized by unresolved and uncontrolled inflammation with multivariable low-grade, chronic and systemic responses that exacerbate the aging process and age-related chronic diseases. Currently, there are two major hypotheses related to the involvement of chronic inflammation in the aging process: molecular inflammation of aging and inflammaging. However, neither of these hypotheses satisfactorily addresses age-related chronic inflammation, considering the recent advances that have been made in inflammation research. A more comprehensive view of age-related inflammation, that has a scope beyond the conventional view, is therefore required. In this review, we discuss newly emerging data on multi-phase inflammatory networks and proinflammatory pathways as they relate to aging. We describe the age-related upregulation of nuclear factor (NF)-κB signaling, cytokines/chemokines, endoplasmic reticulum (ER) stress, inflammasome, and lipid accumulation. The later sections of this review present our expanded view of age-related senescent inflammation, a process we term “senoinflammation”, that we propose here as a novel concept. As described in the discussion, senoinflammation provides a schema highlighting the important and ever-increasing roles of proinflammatory senescence-associated secretome, inflammasome, ER stress, TLRs, and microRNAs, which support the senoinflammation concept. It is hoped that this new concept of senoinflammation opens wider and deeper avenues for basic inflammation research and provides new insights into the anti-inflammatory therapeutic strategies targeting the multiple proinflammatory pathways and mediators and mediators that underlie the pathophysiological aging process. Alzheimer’s disease (AD) is a complex, multifactorial disease involving many pathological mechanisms. Nonetheless, single pathogenic mutations in amyloid precursor protein (APP) or presenilin 1 or 2 can cause AD with almost all of the clinical and neuropathological features, and therefore, we believe an important mechanism of pathogenesis in AD could be revealed from examining pathogenic APP missense mutations. A comprehensive review of the literature, including clinical, neuropathological, cellular and animal model data, was conducted through PubMed and the databases of Alzforum mutations, HGMD, UniProt, and AD&FTDMDB. Pearson correlation analysis combining the clinical and neuropathological data and aspects of mutant APP processing in cellular models was performed. We find that an increase in Aβ42 has a significant positive correlation with the appearance of neurofibrillary tangles (NFTs) and tends to cause an earlier age of AD onset, while an increase in Aβ40 significantly increases the age at death. The increase in the α-carboxyl terminal fragment (CTF) has a significantly negative correlation with the age of AD onset, and β-CTF has a similar effect without statistical significance. Animal models show that intracellular Aβ is critical for memory defects. Based on these results and the fact that amyloid plaque burden correlates much less well with cognitive impairment than do NFT counts, we propose a “snowball hypothesis”: the accumulation of intraneuronal NFTs caused by extracellular Aβ42 and the increase in intraneuronal APP proteolytic products (CTFs and Aβs) could cause cellular organelle stress that leads to neurodegeneration in AD, which then resembles the formation of abnormal protein “snowballs” both inside and outside of neurons. Invasive pneumococcal disease and pneumococcal pneumonia cause substantial morbidity and mortality in the elderly. This review focuses on the immunogenicity, safety, efficacy and effectiveness data on the use of the 13-valent conjugate pneumococcal vaccine (PCV13) in adults. A MEDLINE literature search was performed from January 1946 to December 2017. Additional references were identified from a review of literature citations. All English-language randomized trials, observational studies and meta-analyses assessing the immunogenicity, efficacy, effectiveness and safety of PCV13 in adults were evaluated. Six randomized controlled studies evaluated immunogenicity and safety of PCV13 in adults and showed that the conjugated vaccine elicited a greater immune response to the majority of the 13 serotypes compared to the 23-valent polysaccharide pneumococcal vaccine (PPV23). Administering PCV13 prior to PPV23 elicits greater immune responses and multiple doses of PCV13 demonstrated modest advantage. PCV13 titers declined after a year but remained above baseline. A randomized clinical trial (CAPiTA) showed that PCV13 was effective in preventing community-acquired pneumonia (CAP) and vaccine-type invasive pneumococcal disease, but not any cause pneumonia. Safety data shows PCV13 elicits minor local reactions, such as pain at the injection site. Major side effects that were commonly reported included muscle fatigue and headache. Both local and systemic adverse events were comparable to PPV23. While PCV13 has a well-established immunogenicity and safety profile in adults, there is sparse data on sequential or multiple dosing, efficacy and effectiveness in adults. As there are few countries who have adopted PCV13 for routine adult immunization, there is a need to evaluate the effectiveness of PCV13 in a real-world setting. Murtha Lucy A., Morten Matthew, Schuliga Michael J., Mabotuwana Nishani S., Hardy Sean A., Waters David W., Burgess Janette K., Ngo Doan TM., Sverdlov Aaron L., Knight Darryl A., Boyle Andrew J. The complement system is an essential part of innate immunity, typically conferring protection via eliminating pathogens and accumulating debris. However, the defensive function of the complement system can exacerbate immune, inflammatory, and degenerative responses in various pathological conditions. Cumulative evidence indicates that the complement system plays a critical role in the pathogenesis of ischemic brain injury, as the depletion of certain complement components or the inhibition of complement activation could reduce ischemic brain injury. Although multiple candidates modulating or inhibiting complement activation show massive potential for the treatment of ischemic stroke, the clinical availability of complement inhibitors remains limited. The complement system is also involved in neural plasticity and neurogenesis during cerebral ischemia. Thus, unexpected side effects could be induced if the systemic complement system is inhibited. In this review, we highlighted the recent concepts and discoveries of the roles of different kinds of complement components, such as C3a, C5a, and their receptors, in both normal brain physiology and the pathophysiology of brain ischemia. In addition, we comprehensively reviewed the current development of complement-targeted therapy for ischemic stroke and discussed the challenges of bringing these therapies into the clinic. The design of future experiments was also discussed to better characterize the role of complement in both tissue injury and recovery after cerebral ischemia. More studies are needed to elucidate the molecular and cellular mechanisms of how complement components exert their functions in different stages of ischemic stroke to optimize the intervention of targeting the complement system. Chronic systemic low-grade inflammation is associated with aging, but little is known on whether age-related inflammation affects brain structure, particularly white matter. The current study tested the hypothesis that in older adults without dementia, higher serum levels of high-sensitivity C-reactive protein (hs-CRP) are associated with reduced corpus callosum (CC) areas. French community-dwelling subjects (ESPRIT study) aged 65 and older (N=101) underwent hs-CRP testing and structural magnetic resonance imaging (MRI). Multiple linear regression models were carried out. In the unadjusted model, higher hs-CRP level was significantly associated with smaller anterior, mid, and total midsagittal CC areas, but not with the posterior CC area. These associations were independent of demographic characteristics and intracranial volume. After adjustment for body mass index, diabetes, inflammation-related chronic pathologies and white matter lesions (WML), only the associations between hs-CRP level and smaller anterior and total midsagittal CC areas were still significant, although weaker. These findings suggest that low-grade inflammation is associated with CC structural integrity alterations in older adults independently of physical or neuropsychiatric pathologies. The mechanisms that underlie the pathophysiology of aging, amyotrophic lateral sclerosis (ALS), Alzheimer’s disease (AD) and stroke are not fully understood and have been the focus of intense and constant investigation worldwide. Studies that provide insights on aging and age-related disease mechanisms are critical for advancing novel therapies that promote successful aging and prevent or cure multiple age-related diseases. 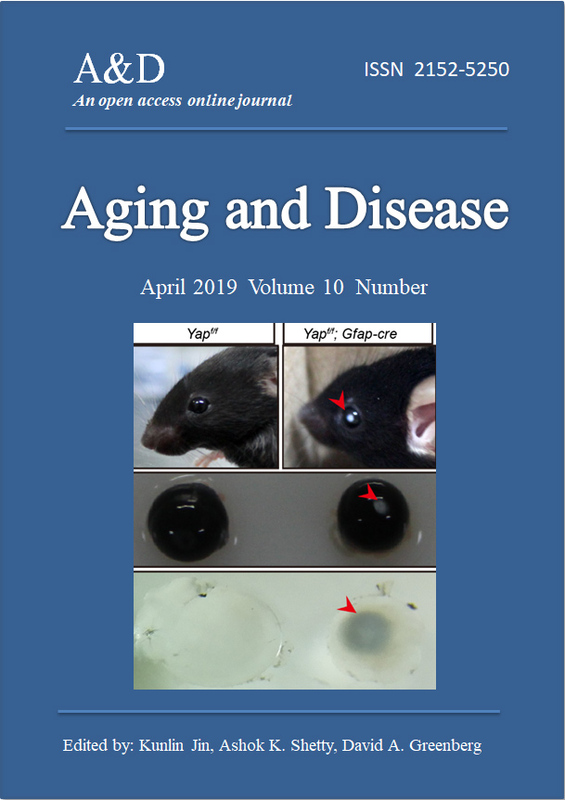 The April 2019 issue of the journal, "Aging & Disease" published a series of articles that confer fresh insights on numerous age-related conditions and diseases. The age-related topics include the detrimental effect of overweight on energy metabolism and muscle integrity, senoinflammation as the cause of neuroinflammation, the link between systemic C-reactive protein and brain white matter loss, the role of miR-34a in promoting healthy heart and brain, the potential of sirtuin 3 for reducing cardiac and pulmonary fibrosis, and the promise of statin therapy for ameliorating asymptomatic intracranial atherosclerotic stenosis. Additional aging-related articles highlighted the involvement of miR-181b-5p and high mobility group box-1 in hypertension, Yes-associated protein in cataract formation, multiple miRs and long noncoding RNAs in coronary artery disease development, the role of higher meat consumption on sleep problems, and the link between glycated hemoglobin and depression. The topics related to ALS suggested that individuals with higher education and living in a rural environment have a higher risk for developing ALS, and collagen XIX alpha 1 is a prognostic biomarker of ALS. The topics discussed on AD implied that extracellular amyloid β42 is likely the cause of intraneuronal neurofibrillary tangle accumulation in familial AD and traditional oriental concoctions may be useful for slowing down the progression of AD. The article on stroke suggested that inhibition of the complement system is likely helpful in promoting brain repair after ischemic stroke. The significance of the above findings for understanding the pathogenesis in aging, ALS, AD, and stroke, slowing down the progression of aging, ALS and AD, and promoting brain repair after stroke are discussed.